The Christmas Eve tradition of NORAD (North American Aerospace Defense Command) updating Santa’s “exact coordinates” began as a printing error. In 1955, a newspaper Sears advertisement included a phone number for children to call and talk to Santa. Except someone at the newspaper made a mistake and printed the direct emergency number for one Colonel Shoup, Director of Operations for the US Continental Air Defense. Unable to ignore the ringing hotlines, Shoup’s staff decided to go ahead and give the children information about Santa’s whereabouts on their radar screens. The military agency has continued to so do every year since, and now has a website devoted to tracking Santa’s progress. Sears has a website devoted to tracking clearance items. The town of Gavle in Sweden is a terrible place to be a giant goat. 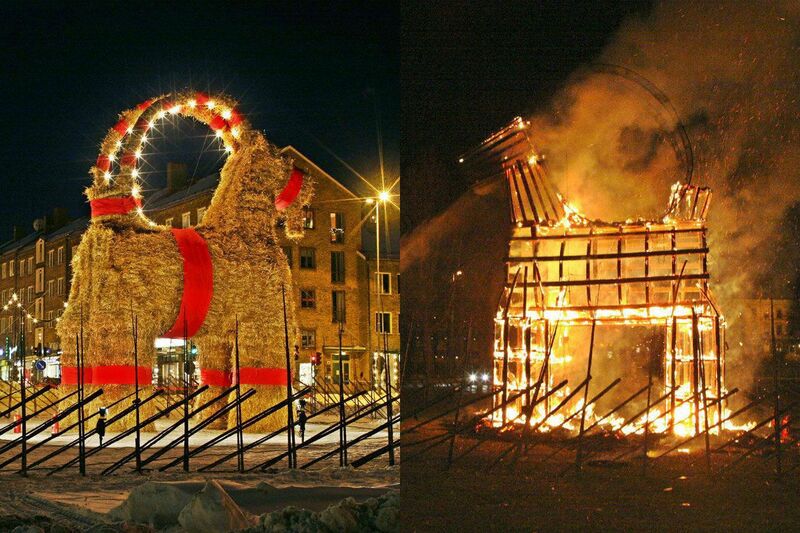 In 1966 a town politician had the idea of erecting three-story goat made of straw (a traditional Swedish Christmas symbol) in the town square. However the lights were faulty and the statue went up in flames on Christmas Eve. Undeterred, they built another three story tall straw goat the next year. Then someone burned it down on purpose. And then the next year’s construction it was hit by a car. And then vandals started setting it on fire every year. In the entire fifty year history of the Gavel Goat, it’s only survived until Christmas twelve times. Someone should gift the town of Gavle a security camera. 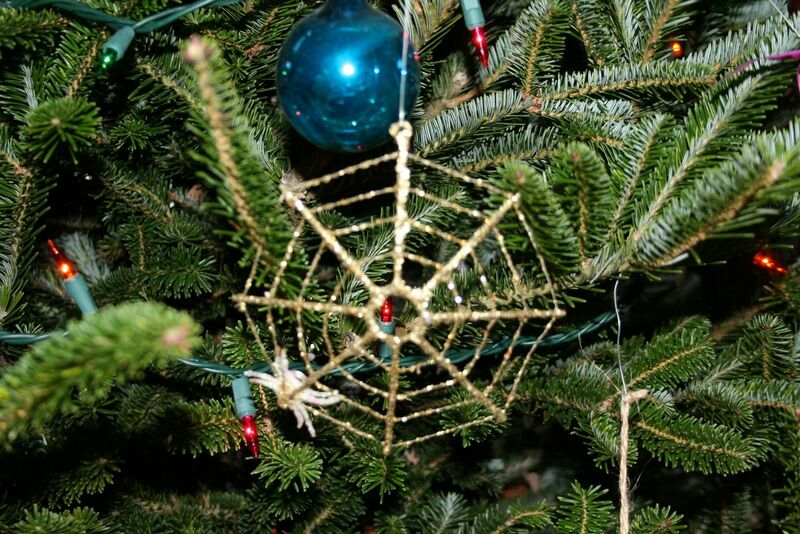 In the Ukraine, spider webs are a traditional Christmas decoration. Which is kinda creepy until you know the story. Legend has it that a poor woman with many children had no money to by gifts or decorate their Christmas tree. Some sympathetic spiders decided to cover her tree in decorative webs, and when the first morning light came through the window, the webs magically turned into silver and gold. I have no idea what makes spiders so sympathetic in the Ukraine. Ours on the farm are pretty apathetic at best. In Caracas, Venezuela, children tie a long red string to their toe before heading to bed. They leave the other end hanging out their bedroom window. On Christmas morning, churchgoers tug the end of the string to wake the children up in time to get to Mass. Think that’s weird? Well, the even stranger part is that the passersby are on roller skates. Dressed as Santa. Why? No one knows that part. I’m guessing it has to do with the Disco era, but I’m likely entirely wrong. Fearing felines at Christmas? Historically, sheep farmers in Iceland wanted to get their wool cleaned and processed before year’s end. So they decided to offer new clothes for Christmas to all those who finished their work. And to those who didn’t? Well they were said to get eaten by the Yule Cat – a giant feline who crept along silently in the snow, apparently hunting people wearing old clothes. Yet another reason to not wear last year’s style. Each year, the Colonial Williamsburg Village puts on an elaborate historic colonial Christmas display. The issue? It’s not remotely historic. In fact, early Williamsburg residents didn’t celebrate Christmas at all. The word never even appears in early documentation. But the museum is honest about the deception. In 1936 they began explaining that they combine other elements of colonial celebrations with our modern conception of the holiday to bring in tourists. Hey, even museums need to keep their doors open. If you like to learn new things about the world, check out the Beekman 1802 Almanac. The spider story was so lovely! I can just picture the tree that greeted them in the morning, shining with the light of love! I’m 80 and didn’t read about the spider story until recently so I loved reading it as silly trivia. At my age I can’t remember anything I should but that little bit of useless trivia always comes into my brain. That’s why I love when someone remembers delightful trivia also. Enjoyed the trivia and will share it with my grandchildren. It will be a Beekman Christmas in my family as well. Thank you for your stories! And the next Holiday Josh can enlighten us with trivia is….? The fife and drum marching colonists of Historical Williamsburg may not be accurate, as stated, but man they sound awesome when there coming up the road. Thank you for an enjoyable interlude! Thanks for the fun trivia, and the youtube marathon. My Christmas wouldn’t be complete without you both. Merry Christmas! I was SO glad to see the one about the spider web from the Ukraine. Many years ago my beloved brother (who died of AIDS 22 years ago) gave me one of those, with the story, and it has held a place of honor on my tree every year since! Lots of other fun oddities, too. Hope you two (and everyone at Beekman) has a wonderful holiday season!! Greetings from Upstate (Binghamton) where I live with tons of Beekman 1802 products, which make me happy and make Winter less harsh. Bless you ….and thank you for the wonderful trivia and the wonderfully witty comments that accompany it, You guys are a treasure and an inspiration….I love it when you are on Evine…great TV to be sure…. and we love ya and share your things with everyone…which means most people on my list are getting Beekman 1802 for Christmas! Merry Christmas, and a very prosperous and blessed 2017!